← How the blade rides. 1. Ace M4 SOCOM stock — better cheekweld, adjustable length of pull, very robust. 2. AK boltface tshirt by which other members of the gun tribe may know you. This entry was posted in interesting people, rifle and tagged 7.62x39, Ace, AK47, stock, tshirt. Bookmark the permalink. Useful accessories? How about eye and ear protection . . . and a sling? I agree! I asked him to remove the sling so the shirt design would show. Eye and ear pro — full agreement! I believe that is the Ace M4 SOCOM stock not the Hammer stock. I think you are right. I updated the post. Bulgarian milled SLR-95. 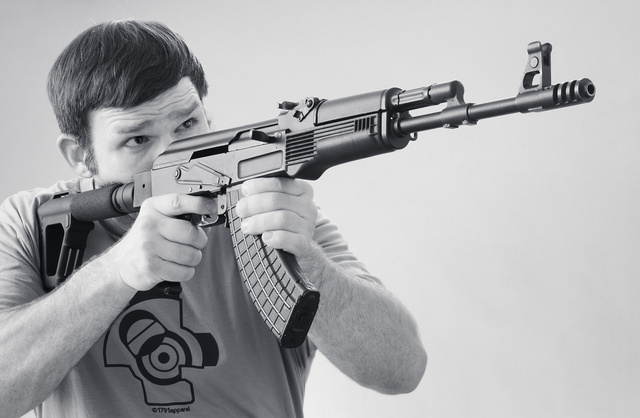 The Cadillac of the semi-auto AK clones. I have the same rifle, albeit with the small-diameter fishgill brake. I have an early (circa 1998) Ace sidefolder for mine, when he was using those leftover FN Para sidefolder buttstocks with a compact hinge mechanism. I’d hoped he would keep refining that variant, because the combined hinge mechanism and receiver block didn’t protrude much past the upper and lower receiver tang, making for a very clean look both open and folded. Bulgarian milled SLR-95. The Cadillac of the semi-auto AK locnes.I have the same rifle, albeit with the small-diameter fishgill brake. I have an early (circa 1998) Ace sidefolder for mine, when he was using those leftover FN Para sidefolder buttstocks with a compact hinge mechanism. I’d hoped he would keep refining that variant, because the combined hinge mechanism and receiver block didn’t protrude much past the upper and lower receiver tang, making for a very clean look both open and folded.